Like any other exterior surfaces, composite decks collect contaminants, duct and dirt, and requires cleaning. In this case, it is necessary to clean them periodically so as to keep them looking good. Here are some tips for cleaning a composite deck so as to help you avoid extra work and get the most out of your decking. When it comes to cleaning your deck, in particular composite varieties, it is critical to choose the right cleaning supplies. In this case, chlorine bleach based cleaning products should never be utilized when cleaning a composite deck. For instance, if a particular cleaning product reads Sodium Hypochlorite, it contains bleach. Why should you avoid these sorts of cleaners? Well, chlorine bleach is extremely corrosive and hence will eat though a composite decking material. It will eventually discolor your deck, damaging the surface while at it. Moreover, it will exacerbate any mildew or mold issues that could occur. The best way to avoid all these issues to opt for non-toxic, sodium percarbonate based cleaning supplies. Pressure washing is not recommended for composite decking, fencing and cladding products, and for a good reason. 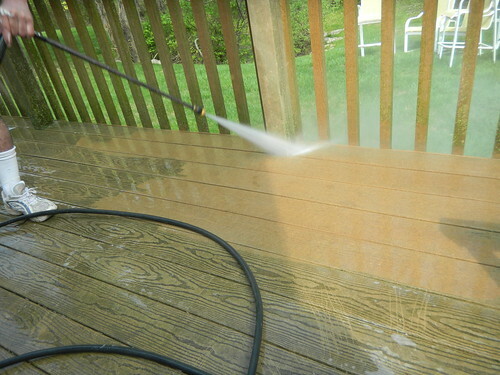 Pressure washing using too much pressure or too close can be ruinous for your composite decks. Once your deck has been “opened up”, this leads to a host of other problems including mold staining of the plastics inside the opening, sun damage and chipping. Once mold or mildew has stained a composite deck, it can be extremely difficult to remove. In a majority of cases, a garden hose should be sufficient for a regular cleaning undertaking. If you must pressure wash, just remember to utilize a household pressure washer with spray nozzle, and keep it at the lowest pressure possible and no closer than 25 cm from the surface. A basic cleaning using a combination of mild soap, hot water and a soft bristle brush or with an appropriate composite deck cleaner is all that is required to keep your deck shining like new. After your cleaning undertaking, rinse thoroughly. If unsure about a particular cleaning product, it is recommended that you test a small area in a not immediately obvious spot to help determine if your cleaning product will cause any unwanted discoloration. Simply hose off your entire deck with an ordinary garden hose and not with a pressure washer. Why, you might ask. Well, the pressure washer will spray particles of soap on all surfaces, perhaps causing staining. Utilizing a common garden hose is a better choice as it will gently rinse off the soapy mixture and remove all water spots. Most people forget to clean the gaps during their regular deck cleaning undertakings. Debris and dirt can accumulate over time, especially in the gaps, collecting a lot of moisture from the air and providing the perfect breeding ground for mildew and mold. Depending on your climate, the gaps between your composite boards should be cleared out at least once a year. This will allow the air to pass between the boards helping to keep the underside nice and dry.